We believe the ideal home for wildlife is in the wild. It is critical to conserve native habitats for wildlife. Wild cats and dangerous animals should not be kept as pets. Captive breeding should ONLY be done in accordance with official Species Survival and Population Management Plans. All wild animals, both captive and in their native habitats, deserve to be treated with respect and not exploited for entertainment and commercial purposes. At Carolina Tiger Rescue, our values drive all our decisions. Those values can be seen in our rescue decisions, our educational programs, and even in our marketing. Everything we do, we strive to do with the utmost respect for the animals. Many aspects of having wild animals in captivity, and how to care for them, are controversial. Carolina Tiger Rescue has established positions that guide our decisions, clarify our message, and distinguish us from other facilities. Carolina Tiger Rescue is opposed to the private individual ownership of all wild cats and dangerous wild animals as pets for any other private purposes. Carolina Tiger Rescue believes that captive breeding is necessary and appropriate only when it can be used to save a species from facing extinction, and that is should only be done in accordance with Species Survival and Population Management Plans. Carolina Tiger Rescue is opposed to captive breeding for any other purposes that does not promote the welfare of the species. A wild animal has already been removed from their native habitat and cannot survive if returned. A wild animal has been abandoned or is injured and unable to survive unaided in their native habitat. Removing individuals from the wild becomes necessary for captive breeding in order to save the species from extinction. An individual was born or lives in captivity and cannot survive or be safely introduced into the wild. Carolina Tiger Rescue is opposed to breeding hybrid species such as the Liger (tiger/lion), designer animals such as the Savannah Cat, and the breeding of wildlife for color selection or other recessive traits, such as white tigers. It is often detrimental to the health of the animals produced. The creation of these animals depletes resources that might otherwise be devoted to rescuing other wildlife or working to save wildlife species in their native habitats. Carolina Tiger Rescue is opposed to breeding wild animals for color selection or other traits, such as white tigers. Such breeding is usually detrimental to the health of the resulting animals and results in the destruction of countless unwanted animals. 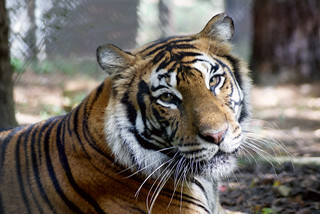 Carolina Tiger Rescue takes no position on de-clawing domestic animals, but is opposed to de-clawing and de-fanging (which includes filling down teeth) wild animals unless it becomes necessary for the health and welfare of the individual animal. Carolina Tiger Rescue takes no position on most legal hunting (see exceptions below), but is opposed to poaching and other forms of illegal hunting. Carolina Tiger Rescue is opposed to canned hunts. Carolina Tiger Rescue is opposed to trophy hunting of all wild cats and any species officially designated as Threatened or Endangered. Carolina Tiger Rescue takes no position on vegetarianism and veganism. Through poaching and other forms of illegally obtaining wild animals or their byproducts. Cannot allow direct contact between the public and prohibited species (lion, tiger, leopard, snow leopard, clouded leopard, cheetah, jaguar, cougar, and any subspecies and hybrid combination of any of these species).